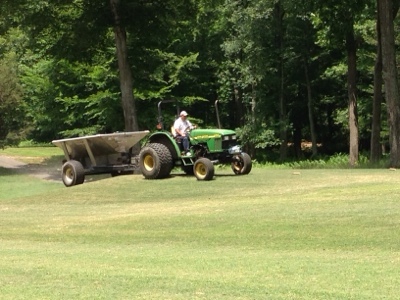 Ammonium sulfate fertilizer being applied at 1lb or nitrogen per thousand square feet. With aeration behind us and warm weather ahead the fertilizer will help enhance the Bermuda grass to take over and out compete the rye grass. There will be some thin and/or Bare spots that will need additional attention throughout the early summer months but we will have a plan to attack those areas as they arise.